I just don’t know where this will stop ! I had a couple of effects left to tat and photograph but they multiplied !!! As mentioned before, since the basic steps are still the same, the text is minimal. But first things first – the string of FBs . 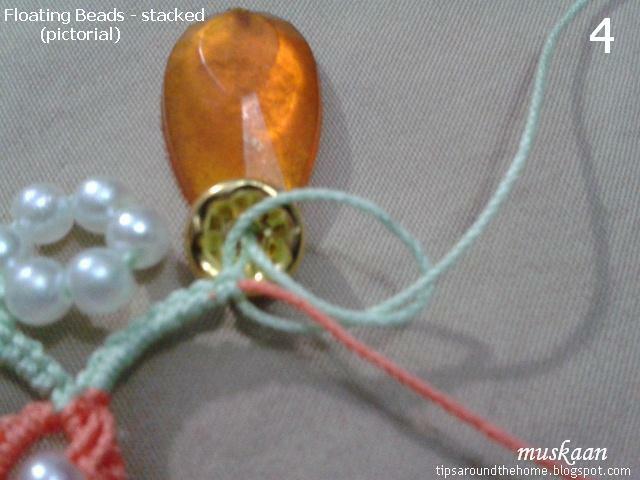 Step1 - loop through bead(s) and fold back around the base. Tension. Step1 varA – pass shuttle through loop. Tension. Step1 varB – work After ring is closed. 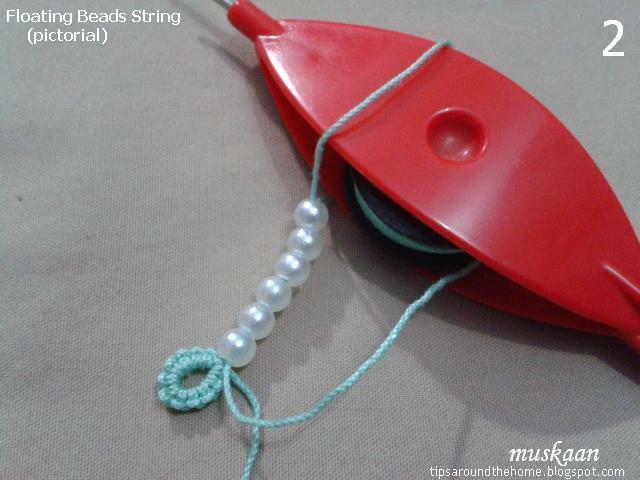 This is a variant of Step 1 where shuttle is passed through the loop that has been pulled through all the beads. 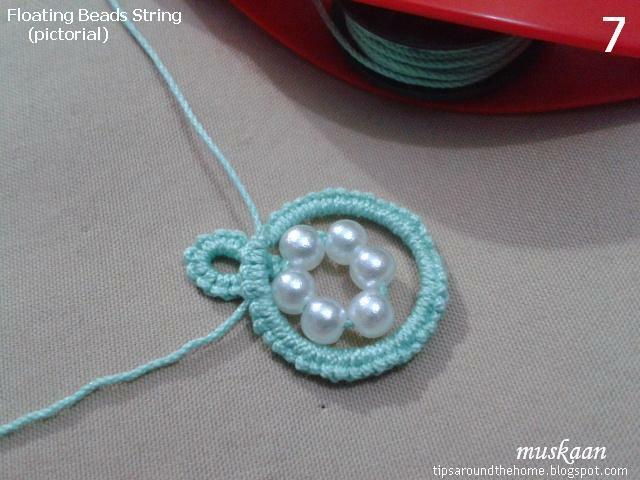 All the rest continues in same way, with a Step 2 overhand knot, and a ring around the beaded string. 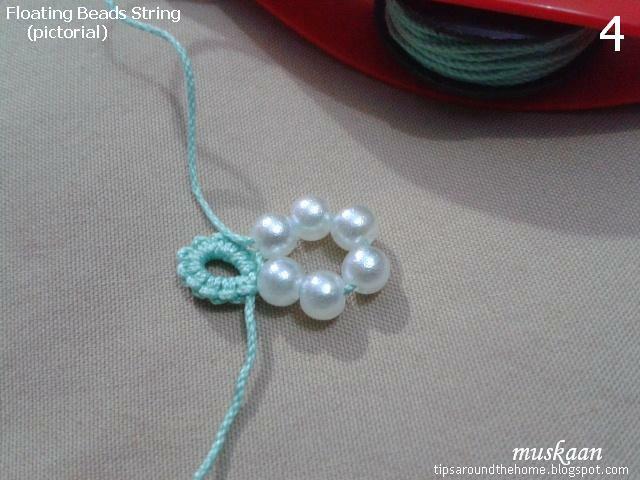 This same string of beads can be used as a central ring (as in the earrings). Only remember to leave some slack on the string to accommodate the lock joins from next round. And below you see it on a chain. We require a 2nd shuttle to make the beaded string on a chain. Tried this idea. It works very well outside the mock ring, using the other shuttle. 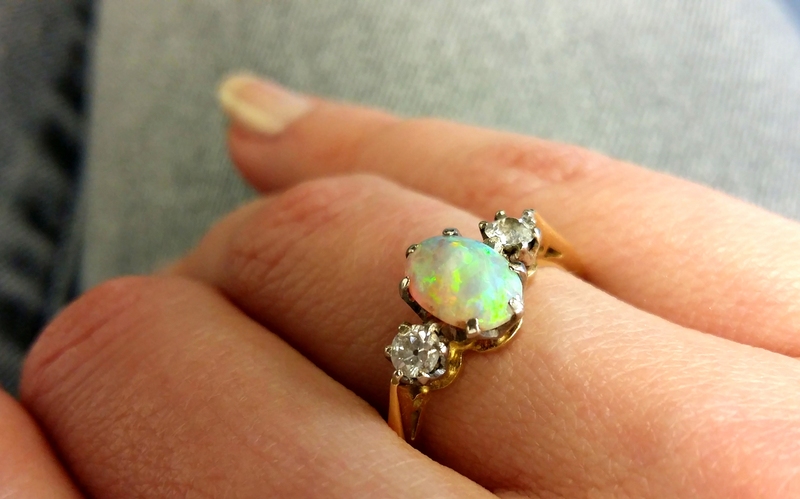 To get a FB on the inside, I completed the mock ring, closed it. Then added the bead afterwards as in Variation B. 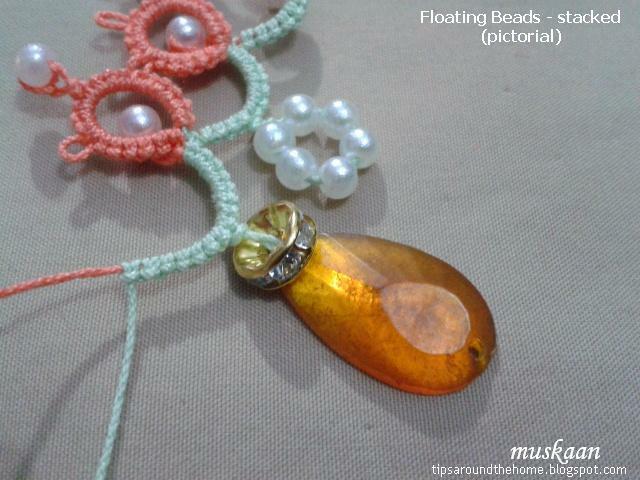 But I’m not too happy with this since this bead is not ‘anchored’ and has a tendency to ‘float’ in a different plane. But at least it is something that can be ironed out in future. Another idea - SCMR with thrown ring and beads inside both or all rings. Is it doable ? What if I want 2 beads STACKED one above other, as in this teardrop and spacer set? I did this on a chain, using the other shuttle. 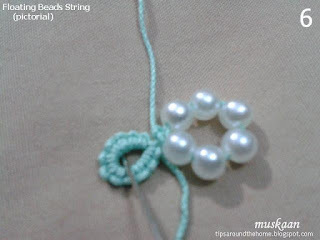 (One can have it inside a ring by using variation B and working the FB After ring is closed). 1. Pull loop through both. 2. Then fold back the loop but encapsulate ONLY the teardrop. 3. 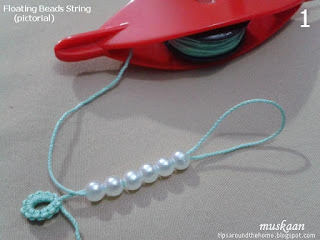 Bring the beads in position, and tension. 4. Step 2 around the base of spacer. Voilà ! No unwinding, no long-winded procedures. And why just 2 beads ? How about more, as in a FRINGE ? 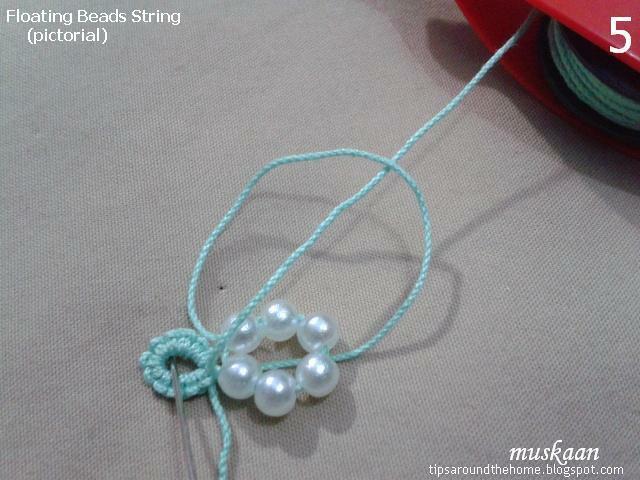 Obviously this will only work if the outer bead is larger or can prevent the loop from unraveling. Thus, in this application, the 2 steps are spaced out. 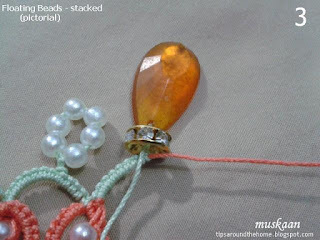 This is what I'd wanted to do with the Radiant Sun paperclip pattern , but at the time it did not work out. Time to revisit? As I mentioned in one of the previous posts, if we leave more space on the ‘shank’ before tensioning Step 1, we can repeat Step 2 multiple times till the shank is covered. Length of shank determines how far the bead will drop lower and how many repeats are required. It can be done both on chains and in rings. 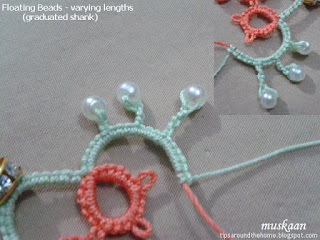 The overhand or half hitch repeats act like unflipped half stitches creating a Josephine chain ! 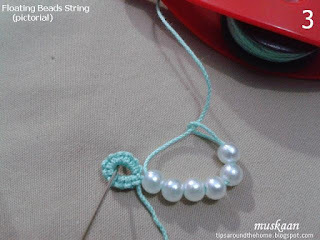 One can use complete reverse stitches as in a Floating Chain. The immense possibilities this offers is up for grabs! I adore this effect! my neurons are shot, elbow is stiff preparing this post and head seems to be floating around! need to get a good grip ... deeeeep sigh. Have fun with these effects while I take a few hours' break. Ready with your shuttles and beads ? Very nicely done and very cute sampler this makes! Beautiful effects!!! 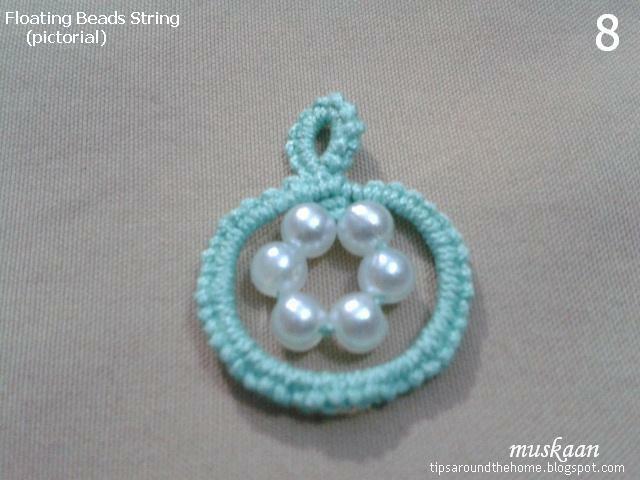 Tempted to bead tatting while I am actually going away from it with dot picots. 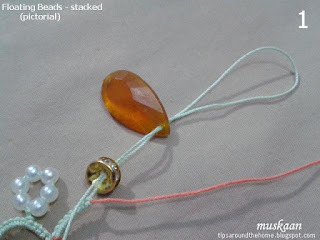 Thanks for sharing technics Muskaan. The sampler does look like a necklace, doesn't it, Carollyn ! Beautiful, great results with your floating beads! 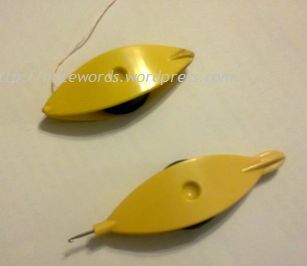 Thanks, Ninetta :-)))) Now if you would use them in some of your exquisite tatting ;-D ??? Fantastic work, could be a great inspiration for many projects! Bring on the beads! 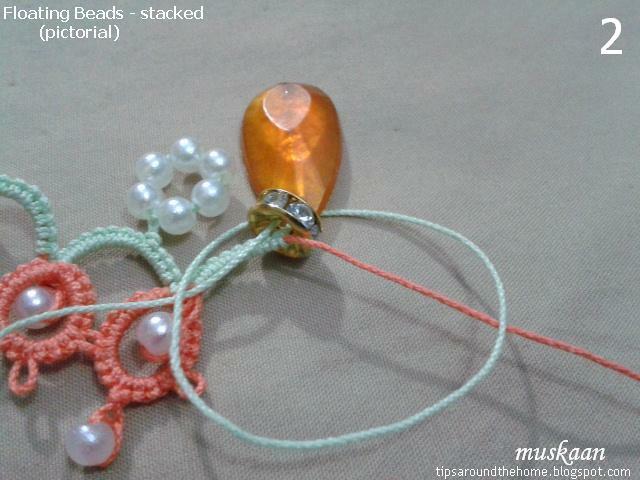 I see a use for the pearl rice beads I have. Your idea is wonderful! And you explain it so clearly. 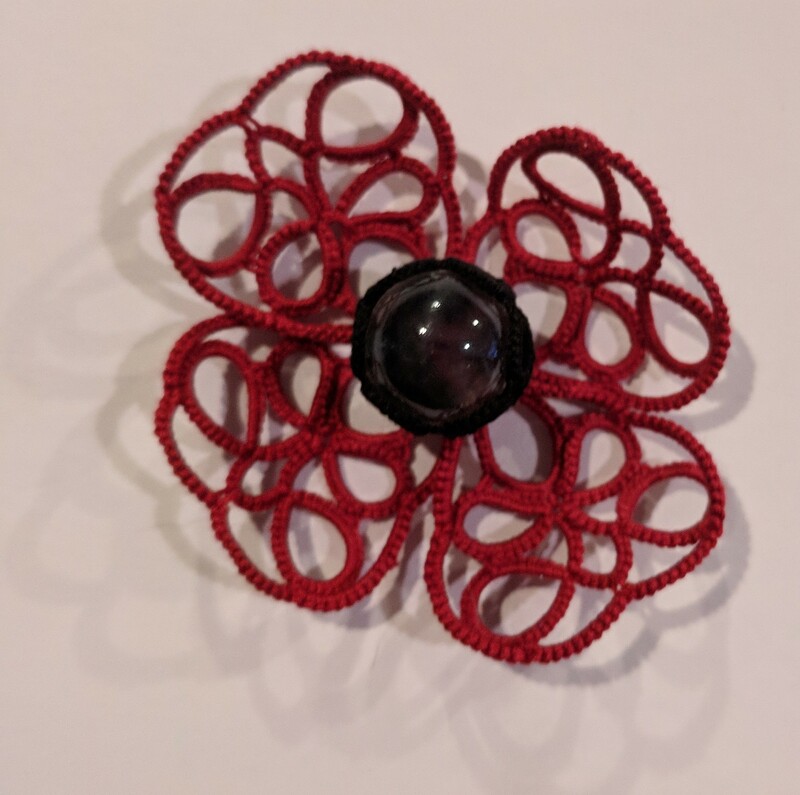 I feel like we've just sat down with a cup of tea and explored tatting together. I hope to see your projects Anetta & Daniela :-) Thanks for your sweet comments. Mel, I'm here with my cuppa - where are you ;-P Wonder what you'll come up with ... rice pearls were quite the craze here some 30 years back.